We’ve all been there: A former co-worker, a friend, or (in my case) a father-in-law who’s absolutely perplexed that you could make a living (GASP!) 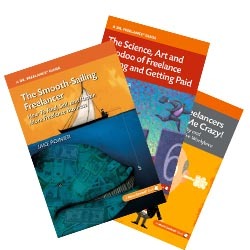 by being a self-employed writer, editor, graphic designer or other type of creative. “When are you going to get a real job?” is among Urban Muse Susan Johnston’s “10 things you should never ask a freelance writer,” and you can try to explain your reasoning…but probably best to laugh and enjoy our little secret about the benefits of freelance jobs. Creating a Facebook Fan page or Tweeting for clients isn’t rocket science, but it remains an unknown quantity in many respects. You need to consider shelf life and return on investment for your client when you price freelance writing for social media. A not-to-exceed estimate can reassure a wary client. Jake is CPR and first-aid certified, but he is NOT a licensed physician and this should NOT be construed as medical advice. Contact your local healthcare provider or, in case of emergency, dial 911.